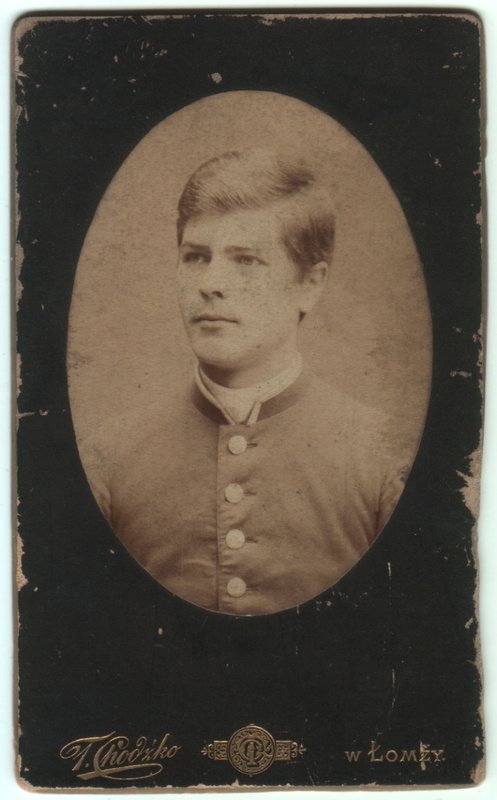 Carte de visite (or CDV-sized cabinet card) measuring 2.5 x 4.25 inches. Photographer is Tyburcy Chodzko of Lomza, Poland. (I’ve also seen the name spelled Tybyrci.) The photo is undated and unidentified, but if I am correct in identifying the photographer, he lived 1840-1908, which helps narrow the date range for the photo. My first assumption is soldier. Maybe it’s just the perfectly coiffed hair, but he seems like a gentle sort, and I shudder to think of the horrors he must have faced in the coming years. If I’m understanding my quickly-googled history correctly, this part of Poland was a part of the Russian Empire at the time. That might help explain the confused spelling of the photographer’s name, if it were being transliterated from the Cyrillic. It would also explain the striking similarity in the uniform seen on the man here in a similar time period but a different part of the world. By the way, if I’m not mistaken (and I might well be mistaken since I don’t read Polish), I believe photos of the photographer himself can be found here. Other examples of his work can be found online, too. Matt, you can still edit your blog after you hit “publish” and it only posts the most recent version. At the very bottom of the post is an “edit” button. Your comment about the future horrors this man may face is one of the reasons I enjoy your blog so much, not that I am looking for horror. But, I like to see the past and future of what the subject’s life might have been like. Quite often I will see people’s family history photos and they look nice but when you view them from current events at that time/location you get a different perspective. Some of the nicest photos have horrendous stories attached to them…but all of it historically fascinating! Thanks, Mrs. P! I’ve actually used the “edit” feature once or twice before after publishing a post, but in this case it was more the timing than the content at issue. Fortunately, there weren’t things I needed to change. And thanks for the kind praise! It’s interesting to me to look at these photos for what they specifically show, but also to look at them in a broader context.